Yeeees! First small step on a long way up (or down? ): I started (rock) climbing (again) a good month ago and want to see if i catch fire. For that (and other reasons) i joined again the DAV (the German Alpin Club) and train with the climbing group at Halle Mensch (every Thuesday and Thursdays) Its fun! And good people! 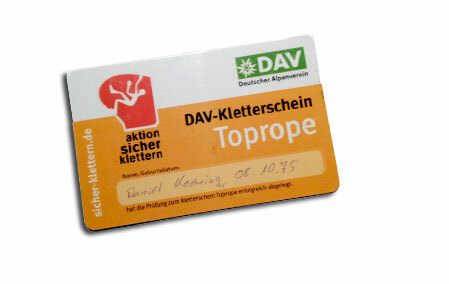 I just finished my „entry“ into the climbing world with a test for toprope climbing and maybe i am ready to go „vorstieg„(lead climbing) end of year, so i could start climbing outside. Cause thats the goal! I love the idea to be outside, hiking into the mountains and climbing on rocks. Of course, Bouldering is an option anyway! Of course, Düsseldorf is not Squamish or the Fontainebleu , but does it matter? No! I love to learn and do new things! If i end up climbing in Yosemite great, if not, it doesn’t matter – start new things, try them out, try yourself out, learn to conquer fear, watch yourself, be in play with your body, mind and the elements and most important have fun! When did you start your last new „thing“?